Discussion in 'Pin Zaps & Swaps' started by coblj003, Apr 3, 2018. 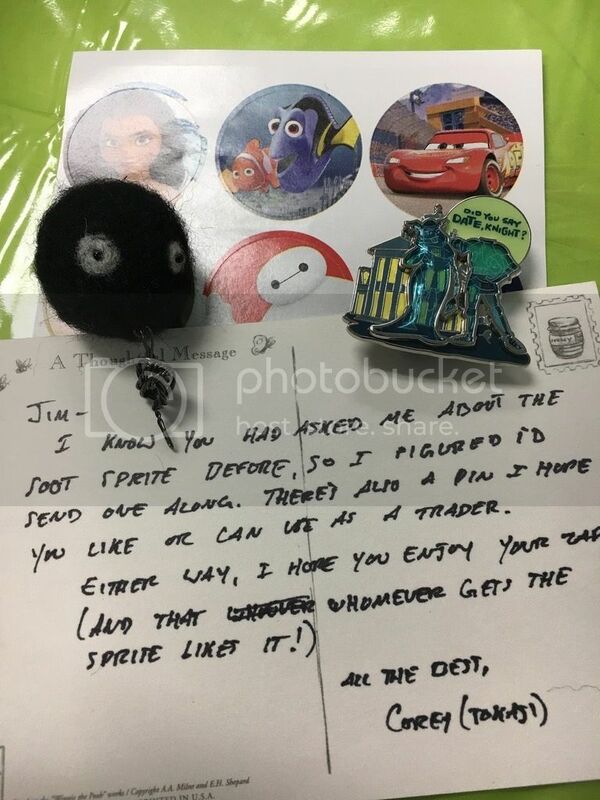 So initially talked with Corey about his felt shop around Christmas and possibly doing a felt soot Sprite for my secret santa. Lo and behold that I was given the felt Sprite to zap forward, some stickers, as well as an awesome Haunted Mansion date night pin. watzshakinbacon, Tokaji, Disneychildwithin and 1 other person like this. Congrats! What is the Sprite from? Unless I am very much mistaken, the awesome Spirited Away. One of Miyazaki’s best IMO. and it looks just right! Great job. Spr175psu, coblj003 and watzshakinbacon like this. Glad it got there safe (even after an address mixup!) and that you like it all! It is indeed, and thank you much! coblj003 and watzshakinbacon like this. They're also featured on My Neighbor Totoro. Ah, yes indeed. Not one of my personal favorites, but a fine film! What an awesome and thoughtful zap! Nice to see a fellow Miyazaki fan on DPF too! coblj003 and Ajk like this. Great zap! My favorite was always Princess Mononoke. There seems like quite a few Miyazaki fans here! How can you not love some Miyazaki? He has a little bit of something for everyone. Spr175psu, coblj003 and Ajk like this. I find that one a bit on the brutal side, but still appreciate it.